Priyanandanan who shot to fame with his second movie venture 'Pulijanmam' is gearing up to entertain the spectators with his upcoming project. Titled 'Njan Ninnodu Koode Undu' featuring Vinay Forrt and Siddharth Bharathan in lead is currently progressing at scheduled locations. New faces Navamy Murali and Aparna Vinod will also play prominent roles in the movie. 'Njan Ninnodu Koode Undu' revolves around the life of two thieves played by the lead actors. The second schedule of the movie will be picturized in Madhya Pradesh. The script of the movie is interesting which can also be called as a political satire. 'Njan Ninnodu Koode Undu' which is a mix of fantasy and real world would be a eye opener for the people. Laced with humour at its best, the movie will be a visual treat for the viewers. The movie would also be a rare chance for fresh faces Navamy Murali and Aparna Vinod to make their space in the malayalam film industry. Priyanandanan who is best known as a filmmaker and dramatist has delivered a handful of interesting movies like 'Neythukaran', 'Sufi Paranja Katha', 'Bhakthajanangalude Sradhakku', and 'Oru Yathrayil', a segment of 'Marichavarude Kadal' released in 2013. He has already announced yet another project titled 'The Voter' which is currently under pre production. 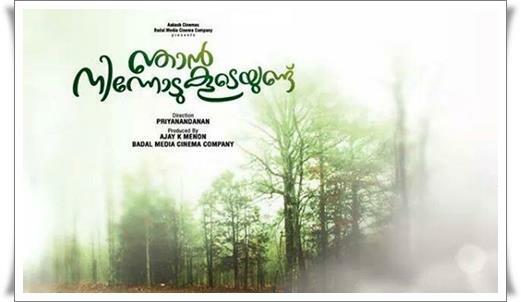 'Njan Ninnodu Koode Undu' is expected to entertain the moviegoers who have always accepted those ventures which stood different. Young actor Vinay Forrt and Siddharth Bharathan will be teaming up for the first time in their acting career. With an experience of working as theatre artist and actor, Vinay rose to popularity with his acting brilliance in 'Shutter'. His upcoming releases include 'Rosapookalam', 'Seconds' and 'Premam'. Meanwhile Siddharth Bharathan who is back to business after a short period has plans to direct a movie with Dileep. Expected to roll from January 2015, the yet to titled movie is expected to raise the career graph of Siddharth as a filmmaker.